Last updated: Nov 23, 2018. 11:47 UTC. OK. How many of you reading this have already bought a domain, but want to change it because you chose your domain poorly? Don’t worry. It happens more often that you think. It’s important to make a good first impression. Quite often your domain will be the first thing they see, whether as a link on another site, social media, advert, or just in Google. Your choice of domain can affect SEO, although this should not be your primary factor when choosing. The affect on your ranking is likely to be miniscule in the long term. You can read more about this here. Your domain can define your brand, and aid with brand recognition. What follows is a detailed guide on the considerations you should take when choosing your domain name. Once you have decided on your name for your website, you will need to register your new domain with a domain registrar. We recommend either GoDaddy, or Namecheap, and you will find a detailed guide here that covers both registrars. A brandable domain is usually referred to as being a non-keyword name with no specific descriptive meaning. A brand name can allude to the product, but they do not tend to spell it out or at least look overly keyword orientated. #1. They are relevant - They relate to the product or service being sold by complementary or implied meaning. #2. They are unique - They tend to be very distinct from your competition. They may be intriguing or have some unique personality. #3. They are memorable - They are easy to remember and recall. #4. Credible - They inspire trust and look professional. For example, they avoid the words “best,” “top,” “honest” in the domain. #5. Brief - They consist of one or two words. This is to help aid memorability but also makes it easier to type the domain or branded search in browsers. #6. User-friendly - They are easy to spell, have no confusing words (ate vs. eight), and do not use numbers as digits, random abbreviations, jargon, and naturally reads as multiple words rather than jargon. I’ll touch on a few of these points separately later, but it is worth associating them now as being characteristics of a branded domain. If you are creating a personal blog, online resume, or other types of personal website, one of my top tips for choosing your domain name is to use your own personal name. .me TLDs can be a great option for this. Making your domain name short makes it easier to type, say, remember and share. I’ll cover in a little more detail these points in the next few points. Wealthy websites have a bigger marketing budget, so can generate more traffic. I personally think the length of a domain does not matter (provided the length is reasonable), so long as the basic principles of branding are there. Namely, it is easy to type, say, remember and share. A great example is that my own website is 12 characters long, but is incredibly easy to remember. “The Webmaster,” flows off the tongue, uses the main .com TLD, and has a descriptive meaning related to the topics discussed on this website. When you register your domain, you should ensure that it is easy to type. Essentially, if you have to spell out your domain for it to be understood, then it is not very good. One example of a well-known brand that made a mistake was social network flickr.com, which launched in 2005. Just four years later, the company acquired flicker.com for a significant sum of money so that they can redirect users that misspelled the domain to the correct one. One lesson from the Flickr example is that if your domain might be easily mistyped, then it may be worth acquiring those domains too when you register your domain (while they are cheap) and redirecting them. #1. Processing fluency - This is a cognitive bias humans have that make it easy to remember things that are easy to say or think about. #2. The rise of Voice Searches - With the rise of Google voice searches, and Voice Assistants such as Siri, Cortana and Alexa it is worth ensuring that your domain can be easily found using these search methods. Domains containing verbally confusing words such as numbers or hyphens may be confused by voice assistants and users alike. I cover those examples in more detail in the next section. But it goes a little further than this. If you own a global brand, you may also want to consider how your domain may be pronounced by your users who speak a foreign language. Numbers and hyphens can make your domain difficult to spell, pronounce and remember. Is that a “one” or an “L”? If you remember it, would you type “numberonecycles.com” because you forgot was spelled using a number? What about the hyphen laden domain? You might remember it as “best cycle store in the world dot com,” but would you remember the hyphens? The simplest way is to just stick to letters. Wait a second. Doesn’t this conflict with what I said about branded domains? As long as you are very careful when choosing your domain not to make it too generic, one broad keyword or related keyword that alludes to what you are selling is good. Using keyword exact matches were all the rage a couple of years ago, but the Exact Match Domain or EMD update that Google rolled out in September 2012 significantly reduced their benefit for Search Engine Optimization (SEO). 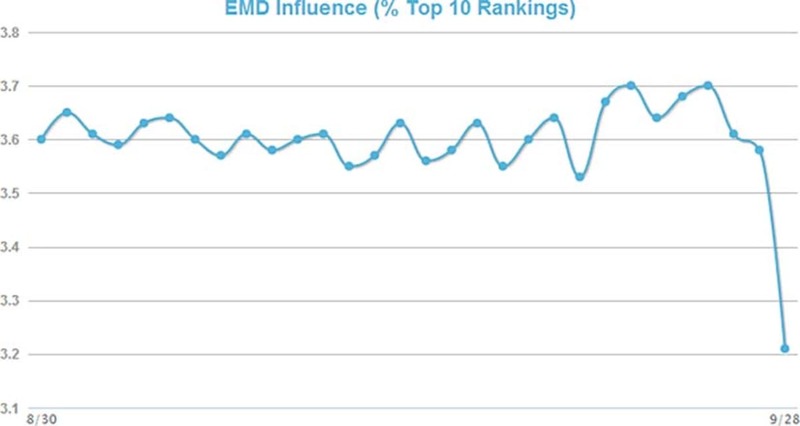 Early data from just after the release of the EMD Update showed a significant fall in rankings for those sites, although there is indication of some minimal benefit. EMD Influence - % Top 10 Rankings September 29 2012. © Moz. That being said, when users link to your website using a naked URL, (www.thewebmaster.com/domain-articles/how-to-choose-a-domain-name/) the domain and URL itself will act as the anchor text. This will be the visual queue used to tell readers what type of website and page may be at the other end of that link. We don’t think you need to worry about keywords in your domain, but having a general or topical keyword may just give you that perfect domain name for ranking in the search engines. You can always add a few keywords in the URL for individual pages, which has been shown to have some small benefit for ranking in the search engines, especially if added to the beginning. One of my favorite tips for choosing the best domain is to think long term. I see so many webmasters choose domains like “bestbikes.com”, or “grilledchickendallas.com” only to realize in a few years time that they want to sell cars, or sell grilled chicken in New York. These examples are bad for many other reasons as well, but they make good examples. Changing a domain in the future can be a lot of work, and result in lower Google rankings (at least for a time). It can also be expensive to changing branding, for example, signs, logos, website design, hiring web developers, SEO specialists, etc. Just take “thewebmaster.com”. I am not restricted to any specific area relating to websites that I can cover. Anything related to websites goes, from SEO, digital marketing to hosting. In essence, it is future-proof. That is what you should be aiming for. Flexibility. Before finalizing your specific domain name, it is worth checking to see if that name is available on social media sites. If someone else has your social profiles, you could lose business to rivals. A successful brand usually has the same name across all social networks, as this makes them easy to find by your customers and other visitors, and provides an appearance of professionalism. The best way to check if your name is available on a specific social media site is to use a tool like KnowEm. One of the most overlooked, and potentially expensive, mistakes you can make is ensuring that any domain you choose does not infringe someone’s trademark, business name or brand. I’m no trademark law expert (I was a UK Property Lawyer for many years), but after a little research, I found a great article laying out the basics of US trademark law. However, on a more positive note, many domain names like coffee.com, business.com cannot be trademarked because they are classed as generic terms. #1. Do a Google Search to see if people are using your chosen business name. #2. Search trademarks registered with the U.S. Patent and Trademark Office (USPTO), and other trademark offices around the world. #3. Alternately, you may choose to use a fee-based trademark search engine, such as Thomson’s SAEGIS database. #4. Use a tool such as KnowEm. While I have already mentioned that you can use this tool to search for available social profiles in section #9 above, you can also use it to search USPTO too. It is also important to search for unregistered trademarks. This is because their existence could prevent you from registering the trademark in your own name in the future. #10. Use .com domain extension, if possible. When searching for an available domain name, it may be tempting to use a .net, .shop, .biz .rocks or some Top Level Domain name extension, other than a .com TLD. Before going this route, just ask yourself whether users actually remember the TLD. I bet you that many don’t. It is clear that com, net and org are the favorite top level domains by webmasters, and are offered by most domain registrars and hosting providers. However, if you want a premium domain (something a little more special, and expensive), or one of the many new domain extensions, then you may need to register it with a more specialist domain registrars, such as GoDaddy or Namecheap. A great alternative to a .com if your intended audience is restricted to one country (i.e. you are a local business), is to use country codes, or ccTLD. An example is .us for the United States, or .uk for the United Kingdom. Please be aware that Google treats these as a country specific domain, and therefore will only be listed in the relevant countries Google Search. I’ve created a simple step-by-step guide on how to register a domain with GoDaddy or Namecheap here. 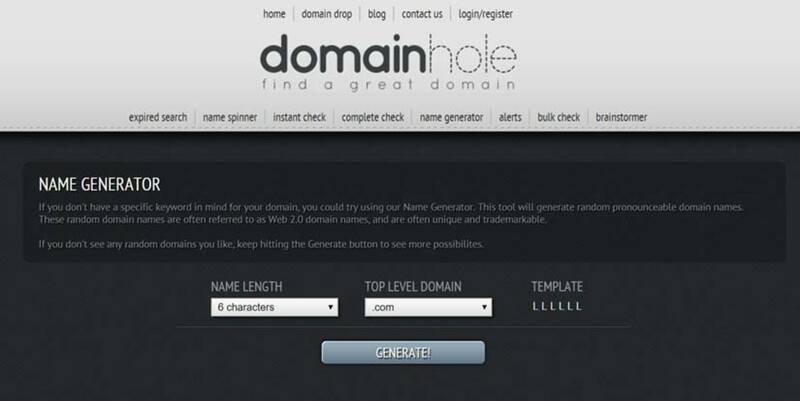 In the penultimate tip, using domain name generation tools can help you choose the best domain by providing valuable ideas that you can compare against my previous tips. 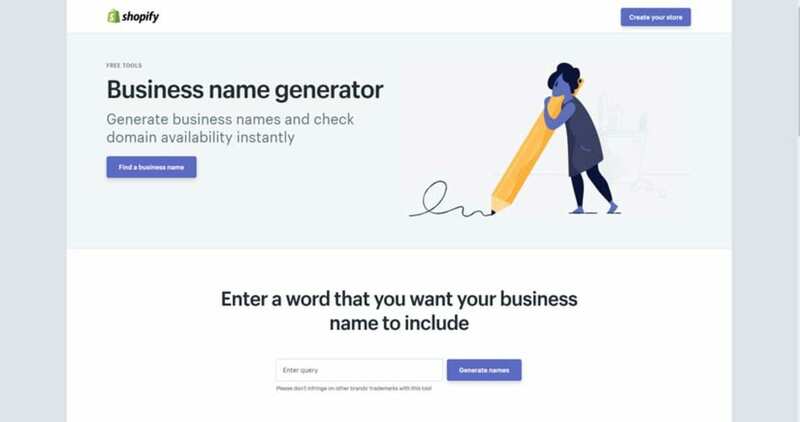 #1. Business Name Generator - This is a free tool from Shopify that all combines your keyword with other words to generate a large and sensible list of available domain names. #2. Lean Domain Search - This is another tool that matches your keyword with other words, while also checking whether that name is available to register. Lean Domain Search. © Screenshot. #3. Wordoid - This is an “intelligent naming tool”, and while it won’t check whether your specific domain choice is available, it can help you find that creative, brandable name that consists of a made-up, easy to pronounce word. Expired domain search: Search recently expired domains. 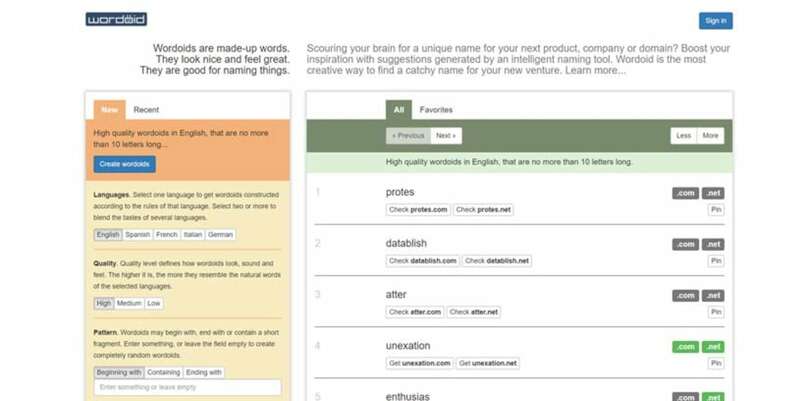 Name Spinner: Combine keywords with hundreds of words to get name ideas. Name Generation: Generate random, unique, brandable, and pronounceable business names. Brainstormer: Their unique brainstorming tool. Finally, when you think you have found the perfect domain, you should check its content and SEO history. #1. Old website content - You can look through the history of a domain (if previously registered) by using web.archive.org. This will show you snapshots of any website going back as early as 1996, and allow you to see the type of content it contained, and give you an indication of when the domain was first used. #2. SEO History - You may wish to avoid any domain that has been used by black hat SEOs. A domain that has a dubious backlink profile may be penalized by Google and may take much work, time, and cost to rectify. Good tools for this include ahrefs.com or cognitiveseo.com. You can usually get a limited free trial that will indicate whether there is a problem, and creating a disavow file (a file containing a list of links that Google should ignore) for all the bad backlinks is relatively painless.